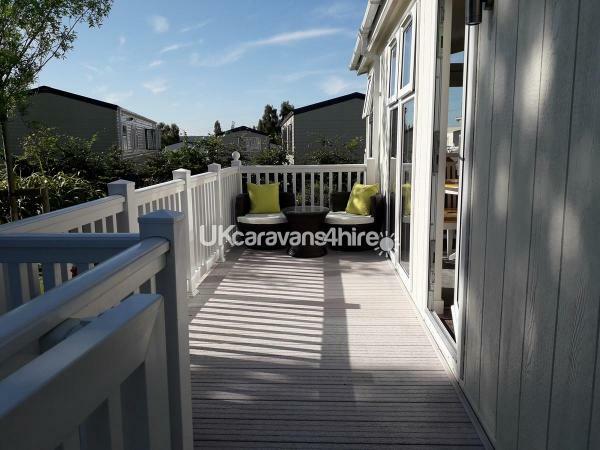 £100.00 deposit to secure dates payable within seven days of reservation request. Balance plus £100.00 returnable security bond due eight weeks prior to start of holiday. Preferred payment method bank payment. 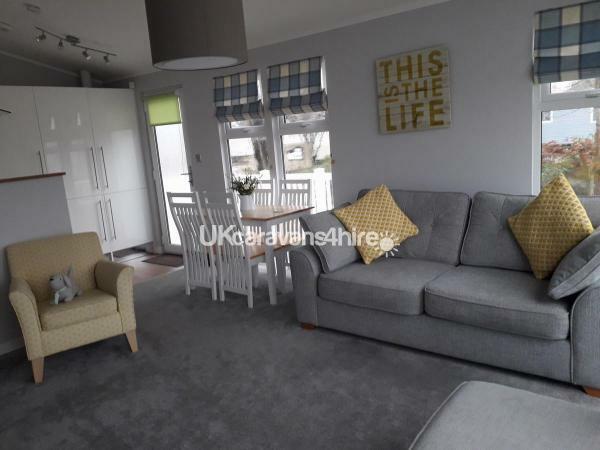 Security deposit repayable within 10 days of holiday end once holiday home has been checked by cleaner. Please state the size of your party, number of adults and children. £100 non refundable deposit to reserve your dates. Hire balance due 8 weeks before your holiday plus a £100 damage/anti social bond refunded on departure once van checked Our preferred payment method is bank transfer. Full terms and conditions will be emailed before you pay any deposits and additional copies are available at any time. 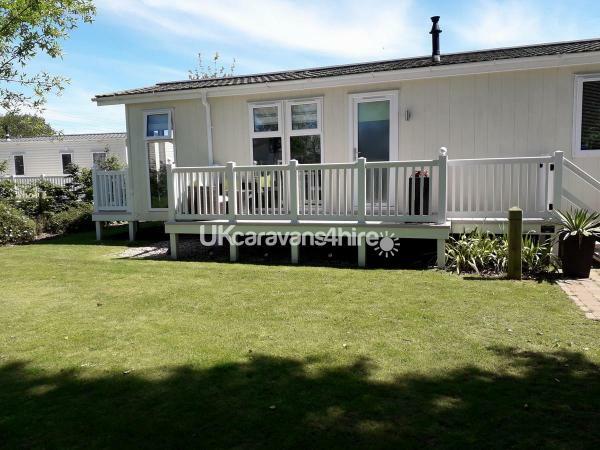 Our spacious Wessex Beach House Lodge is built to BS3632 residential specification and is situated on a large corner plot on the 5* Haven Holiday Park, here at Rockley Park in Poole, Dorset. It has everything you need for a memorable holiday. Full gas central heating, double glazing. 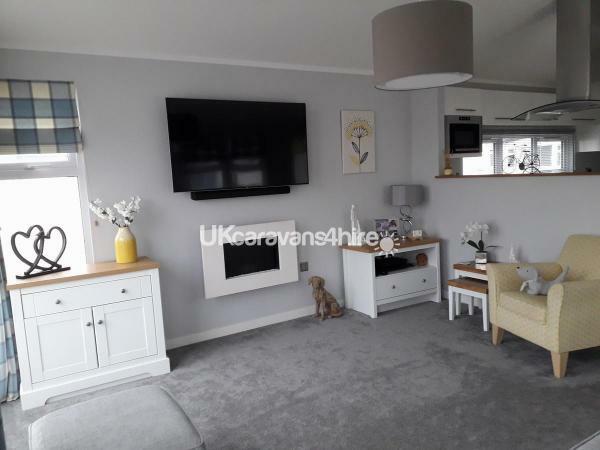 The larger than average kitchen has a dishwasher, full size gas hob and electric oven, fridge and a seperate freezer, microwave, toaster and iron, ironing board. Plenty of kitchen cupboards and kitchen utensils, plus pots and pans etc. The spacious lounge has 2 x lots of patio doors, lots of windows and high ceilings, giving the van a light bright and airy feel. Perfect for that feel good holiday vibe. The lounge has a 55" flat screen TV plus sound bar, the basic Sky package & freeview plus a dvd player with a selection of dvd's. It also has free standing furniture, the dining table seats 4. The family bathroom has a large walk in shower. 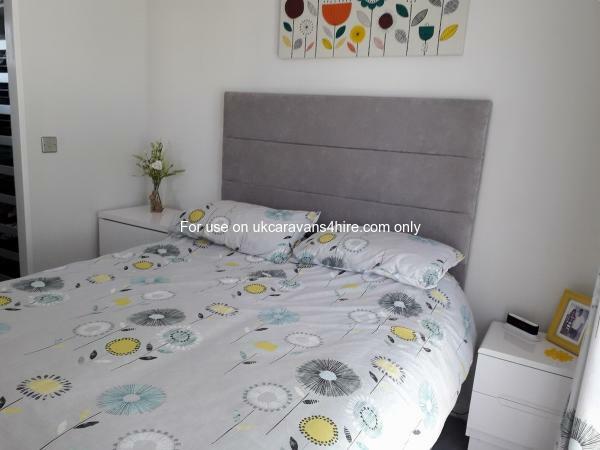 The main bedroom has a king size bed, plenty of storage & wardrobe space, a 32" flat screen TV with freeview, plus a hairdryer. 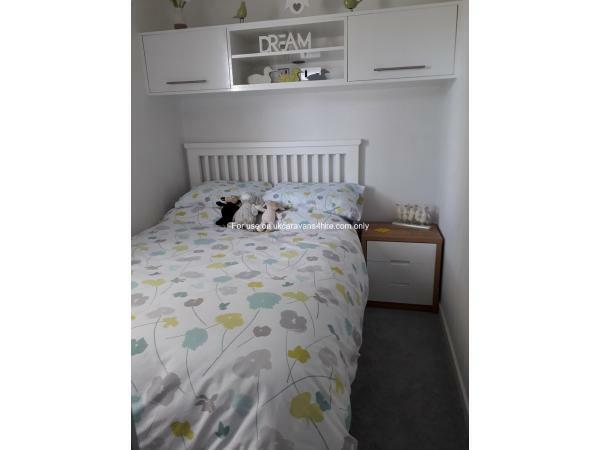 The 2nd bedroom has a full sized double bed again plenty of storage space 32" flat screen TV with freeview. We can supply a bedguard, travel cot and high chair if needed. There are also 2 electric fans if you are lucky enough with the weather. 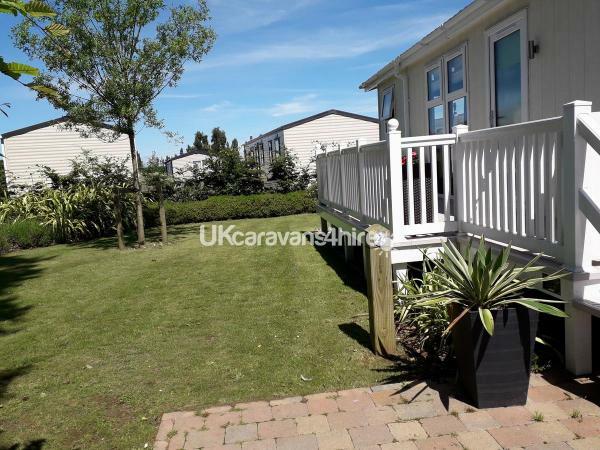 On the side of the van is a safe veranda with a lockable gate plus rattan furniture, there is also a picnic table if you fancy eating alfresco. At the front of the van is a smaller veranda accessed via the lounge patio doors. We are lucky enough to be on a large corner plot, so there is plenty of room for the kids to play, it is like having your own garden. 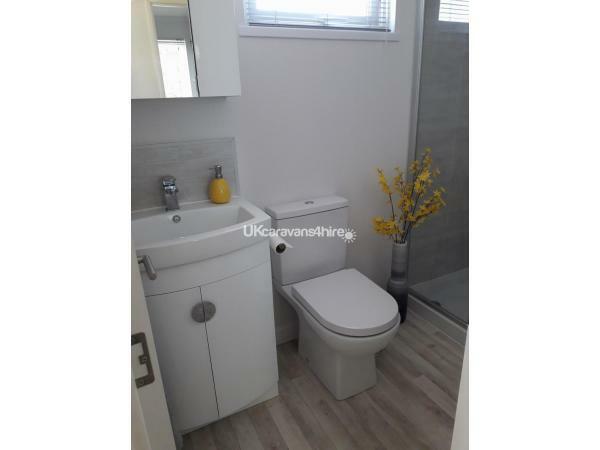 You will have your own private block paved parking for 2 cars. We are close to the main complex and only a short walk from Rockley's beach. We supply bed linen, hand towels and tea towels, please bring your own bath towels and beach towels. We also supply washing up liquid, condiments, toilet rolls and liquid soap. Additional Info: FunWorks passes are NOT included in the price and can be purchased on arrival at reception or we can send out a form for you to pre book directly with Rockley. These passes allow the use of the heated outdoor and indoor pools, flume and a variety of children's clubs. Also included are leisure and entertainment activities arranged throughout the day and evening for all ages around the complex, beach and Show Bar. aqua jets, aqua gliders, kayaking, turbo paddlers, crazy golf, climbing wall, all weather bowling green, bike hire, archery, tennis, archery, fencing coaching, fitness classes. Other activities and facilities include the use of the small but well maintained safe beach and children's park area. Coffee shop on the beach. Fishing and crabbing. There is a Spa on site exclusively for Rockley guests. Glorious Sandbanks beach is approximately 20 minutes by car as well as the ferry to Studland Bay. A bus links you to the surrounding areas, with a bus stop 5 minutes walk from the caravan, there is also a land train that goes to Poole. A non- refundable deposit of £100 is required at time of booking to secure your holiday dates. The balance of your holiday plus a £100 security deposit against breakages and damages will be due 8 weeks prior to arrival. Pre booked holiday dates that are not paid in full by 8 weeks prior to the date of arrival will be re- opened for sale and any deposit payments will be lost. The security is refundable within 10 days of departure, once cleaner reports all is satisfactory. Holiday cancellation insurance is NOT included in the price but is recommended and is widely available at a reasonable price. There is a grocery store on site and superstores a few minutes away by car. Poole Quay is well worth a visit, 10 minutes away by car. We aim to make your stay as comfortable as possible. If you are not familiar with Rockley Park, suffice to say that people come back year after year for the surrounding location and facilities of this 5* park. There are endless things to do on and off site. This can be seen on their website. This is a glorious part of Dorset. Please phone, text or email for further details.